Under Riccardo Tisci since 2005 Givenchy continues to be one of the most in demand names in fashion. Statement prints, cuts and accessories set the trends season after season. 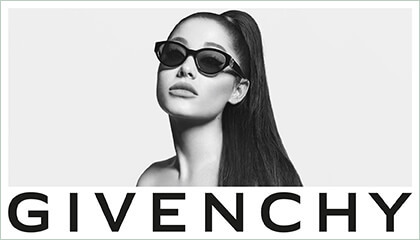 The unmistakable V shape from Givenchy's coveted Antigona bag influences the latest sunglasses collection superbly in slick metal temple pieces and striking angular frames. Signature sleek polished wood grain effects and catwalk colour make for more luxuriant finishes. The Givenchy G decorates several frames with a new linear look. Givenchy sunglasses’ cult status is ever growing. They have recently been demonstrated by Rosie Huntington-Whiteley, Madonna, Kate Bosworth and Poppy Delevingne.